My answer….It is tempting to think that one can simply “chop off” a dorsal hump on the bridge of a nose. But there are several things that you must realize about this procedure. 1. 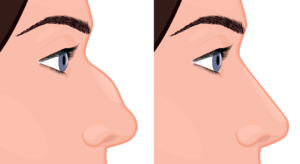 When you reduce a hump, you are lowering the height of the bridge of the nose. Because the nose sits on your face like a triangular pyramid, lowering the bridge results in removing the narrowest part of the pyramid and you are left with a wider portion. So there may be a tendency for your nose to appear wider on the front view after hump reduction. The amount of widening depends on how thick your skin is, how much the bridge is narrowed, and how wide you were from the start. 2. Once the dorsal hump is removed and lowering of the nose bridge is complete, then the skin must be draped down onto the reduced nasal infrastructure. For patients with thin skin and a small or medium hump, this is not a problem. If you have thick skin, especially if a lot of reduction is done, the skin may not be able to drape cleanly onto the structures of the nose. In these situation, the skin remains a bit raised above the bone and cartilage of the dorsum, and some outward fullness remains. This is called a soft-tissue polybeak deformity. 3. If the hump involves the cartilage part of the dorsum, removing it may lead to collapse of the cartilages that form the middle part of your nose. So in summary there a lot of things to think about before going through a procedure like this. Rhinoplasty is a complex operation with many variables and considerations, even for a change that you might think is simple. the best thing to do is to do your homework and seek treatment from someone who has a lot of experience with rhinoplasty.